Long Life Noodles (yī miàn, 伊面) or yi mein, symbolize longevity and can always be found on the banquet table at Chinese celebrations. Yi Mein, also known as e-fu noodles are always served at birthday, new baby, wedding or lunar new year banquets. Sample a noodle while cooking, and when it tastes closer to the uncooked side of al dente pasta, it’s ready. When the noodles are done, immediately drain and set aside. Dissolve the sugar and salt in 1 tablespoon of hot water, and add the regular soy sauce, dark soy sauce, oyster sauce, sesame oil, and white pepper. Stir until combined. 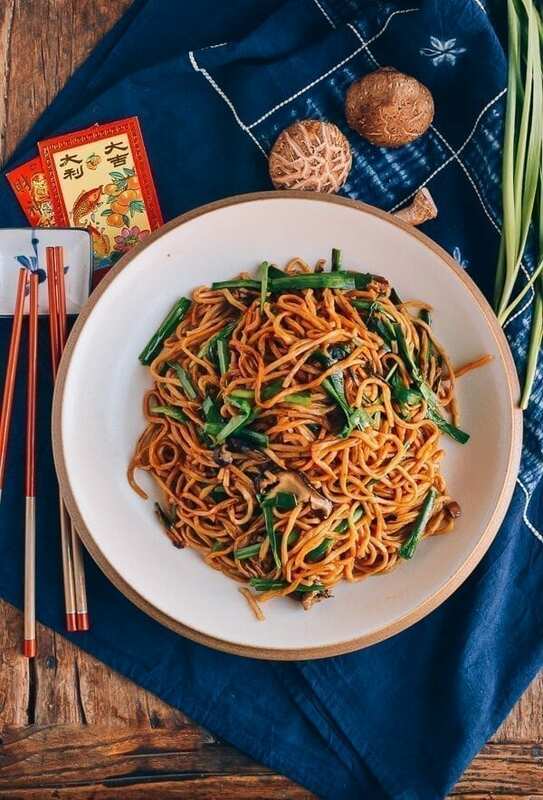 Spread the prepared sauce mixture evenly over the noodles, and stir-fry everything together for 1 minute, or until the soy sauce mixture is distributed evenly. Spread another tablespoon of oil around the perimeter of the wok to prevent sticking if you feel you need it. How much oil you use is definitely a personal preference. If the noodles stick together, drizzle a bit of oil directly over the noodles. You can also add a splash of hot water if the noodles are too dry, even after adding the sauce. Add in the remaining green parts of the chives and mix until they turn bright green and the noodles are heated through. This will take 1-3 minutes, depending on if your noodles were cold or still warm when you started stir frying, and how hot your stove and wok can get.